√ How to REVERSE the meal planning process using the 2-Minute Planning formula to work out how much food to buy. √ The easiest way to cook with the SEASONS / the ingredients you have on hand using ‘template recipes’. Freeing you from the constraints of traditional recipes. √ The secret to making sure you NEVER have to eat a meal you don’t feel like. √ How to avoid the waste normally caused by a change in ‘plan’. √ 63 ‘Template’ recipes to adapt to your tastes, allergies and ingredient availability! Avoiding the boredom of eating the ‘same old’. √ The quickest, easiest way to adapt to changes in your schedule. √ Learn from real life examples! in the ‘4-Weeks in March’ FREE bonus eBook. 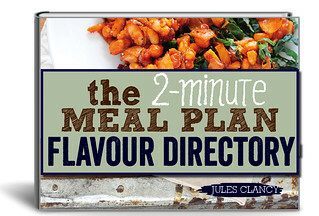 √ Ensure your cooking tastes delicious, with the FREE Bonus ‘Flavour Directory‘. Master the classic flavour combinations from around the world. √ Plus! Includes the FREE bonus ‘Quick Start Guide‘ that will have you effortlessly using the 2-Minute Meal Planning System in no time at all. √ PLUS! Always have The 2-Minute Meal Plan at your fingertips. Save on your work computer, home computer, smart phone AND iPad. Click the “ADD TO CART” button below to get INSTANT ACCESS to download The ‘2-Minute Meal Plan System’. To pay in Australian dollars CLICK HERE. What Is The 2-Minute Meal Plan System? 1. A simple ‘formula’ to help you figure out how much food to buy. The formula is quick and easy to work out. If you can count, you’ll be able to do this in your head. It tells you how much food to buy so you don’t end up with excess food. It gives you freedom to shop for what looks best, rather than having a rigid list. If you’d prefer to have a few specific recipes in mind before you shop, the formula will help with that as well. 2. The collection of 63 ‘template’ recipes. These help you learn to cook based on the ingredients you have on hand. It includes general templates for how to make different classic dishes. For example a great stir fry, a quick soup or a fragrant curry. Each template comes with suggestions for variations so you’ll be able to adapt them to the ingredients on hand. It’s a way to learn to cook more creatively, while still having a basic recipe to follow. This clear, practical, reference system is focused on helping you plan your meals in only 2 minutes per week, even if your schedule is always changing and you never know what you’ll feel like. Introduces you to the ‘2-Minute Planning formula’ and the ‘2-Minute Planning System’. Also covers 8 tips to set you up for success. √ How to make life as easy (and as waste-free) as possible. √ The number 1 tip for buying the best fruit & veg. √ The simplest storage techniques to maximise the life of fresh produce. √ The 3 major causes of food spoilage. √ 6 quick and easy ways to preserve food at home. √ ‘Mise en place’ – What is it? And how can we use this chef secret to our advantage? √ 6 tips to make leftovers last as long as needed. √ 11 fun ideas for ‘reinventing’ leftovers. √ Common leftover ingredients. How to keep them fresh & creative ideas for using them up. √ Multiple suggestions for variations so you’ll be able to adapt to the ingredients on hand, cater to practically ALL diets or food allergies and guarantee you’ll never get bored. √ A detailed problem solving guide to help you avoid common mistakes. √ Serving suggestions to serve each dish in the most appetizing way. √ ‘Leftover potential’ details so you know the best way to store and use any leftovers, keeping waste to a minimum. See the 2-Minute Meal Plan System in action! ‘Watch over my shoulder’ as I plan, shop and cook, 5 days a week over 4 different weeks. Condenses the 2-Minute Meal Plan System into the core essentials. Designed to get you up and running as quickly and effortlessly as possible. √ The 7 golden rules of flavour pairing. √ Flavour profiles & classic ingredients from around the world. √ PLUS! Always have The 2-Minute Meal Plan at your fingertips. Save on your work computer, home computer, iPhone AND iPad. √ 63 detailed step-by-step video template recipes. 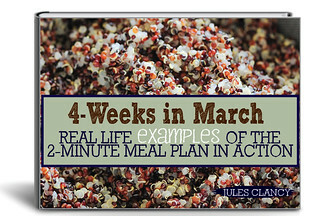 √ Video version of the ‘4-Weeks in March’ bonus ebook so you can literally watch over my shoulder, into my fridge and even into my veggie garden as I plan, shop and cook each week. √ PLUS! 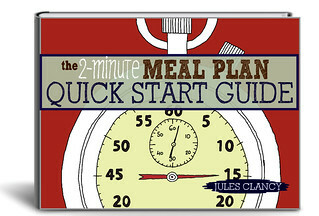 Video version of the ‘2-Minute Meal Plan Quick Start Guide’ to get you up to speed as quickly and effortlessly as possible. Love Print Books? Not Sure You’ll Use a Digital Product? Q. 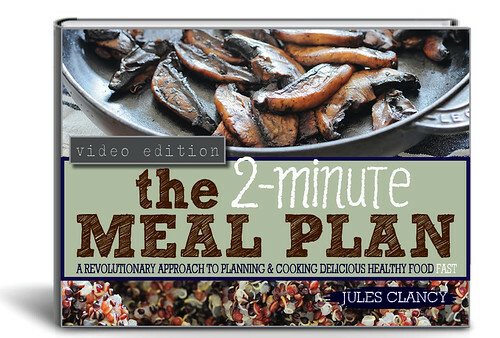 Does ‘The 2-Minute Meal Plan’ have vegetarian / vegan alternatives for the recipes? A. Yes! All recipes are easy to make and only use 5 ingredients. They’re also quick. Most recipes can be made in 15 minutes or less – although there are a few do-ahead recipes that will take much longer. Q. Is this really going to make a difference to my meal planning? A. The 2-Minute Meal Plan has already helped hundreds of people completely change their meal planning system. I’m sure it can help you too – but you must be willing to step up and give it a try. The only way you’ll get results is to take action, which of course is something that only you can control. Remember I’m here to help. I’ll be with you every step of the way. And if, for some reason you can’t get it to work for you, I’ll be happy to give you your money back. Q. I’m not a confident / creative cook. Will I be able to tackle the template recipes? A. If you’re willing to give them a try, absolutely! All the template recipes have a maximum of 5 ingredients. I’ve made them as simple and easy to follow as possible to help you take baby steps while learning to cook without recipes. There is also the option of the video edition which includes a video for each recipe where I show you step-by-step exactly what to do and how it’s meant to look at every step. Again, you can always ask for a refund if you find the template recipes too difficult for you. Q. I prefer print books. Is ‘The 2-Minute Meal Plan’ available as a traditional book? A. I’m afraid not. All my books are ebooks except for my print books ‘5 Ingredients 10 Minutes’ and ‘And the Love is Free’.